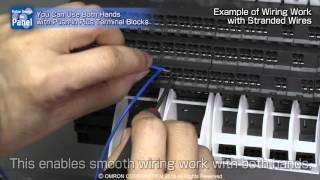 https://industrial.omron.eu/panelbuilding Our components for electrical control panels provide push-in plus technology. 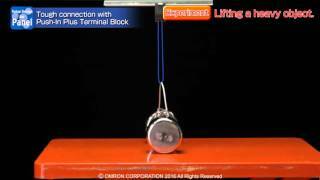 See how the wires are held firmly in place into the screwless terminal block. 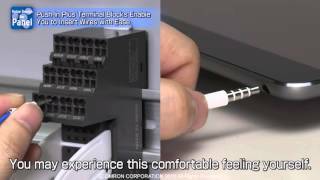 Also less insertion force is required - wiring is easier than inserting an earphone jack. 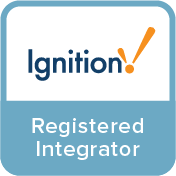 https://industrial.omron.eu/en/solutions/panel-building Our components for electrical control panels provide Push-In Plus technology. 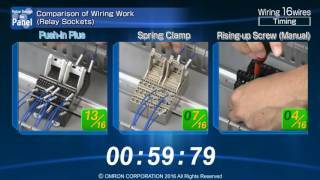 See how fast you can wire up 16 terminals compared to both spring clamp and screw technology. Also less insertion force is required - wiring is easier than inserting an earphone jack. 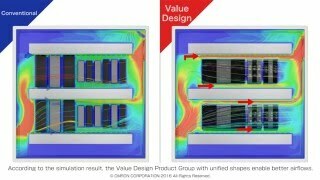 https://industrial.omron.eu/en/solutions/panel-building Our components for electrical control panels provide Push-In Plus technology. 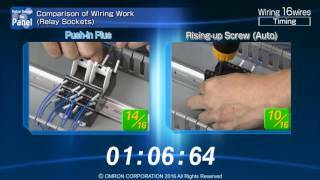 See how fast you can wire up 16 terminals compared to screw technology + automatic screwdriver. Also less insertion force is required - wiring is easier than inserting an earphone jack. 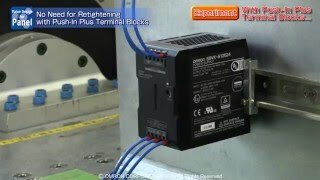 https://industrial.omron.eu/panelbuilding Our components for electrical control panels provide Push-in Plus technology. It is extremely suitable to build robust control panels that withstands vibration during both shipping and operation. https://industrial.omron.eu/panelbuilding Our industrial components for electrical control panels provide push-in plus technology. A patented advanced mechanism design incorporated into our push-in terminal blocks involves a spring to allow low insertion force which enables easy insertion with thin wires. https://industrial.omron.eu/panelbuilding Our industrial components for electrical control panels provide Push-in Plus technology. A patented advanced mechanism design incorporated in the screwless terminal blocks involves a spring to allow low insertion force, while ensuring high pull-out force. https://industrial.omron.eu/panelbuilding Our industrial components for electrical control panels provide push-in plus technology. 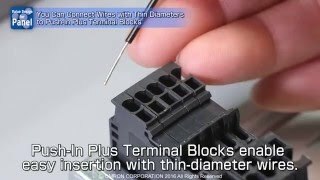 See how the Push-In Plus terminal blocks make it possible to use both hands, even when mounting stranded wires without a ferrule. Due to the special construction, the screwdriver remains in its position allowing hands-free operation. https://industrial.omron.eu/panelbuilding Our industrial components for electrical control panels provide push-in plus technology. 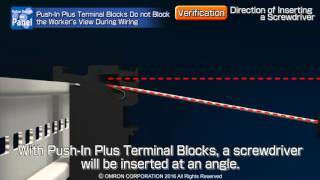 Watch how the Push-In terminal blocks have a clear view angle, even in case a screwdriver is used when mounting stranded wires without a ferrule. 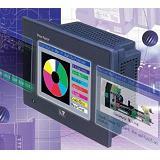 https://industrial.omron.eu/panelbuilding A standardised, unified panel design means design simplicity for panel builders. Moving to a uniform panel design avoids the dead space that results from specifying industrial components of differing height. It also reduces the electrical panel design work required. Most importantly, the hot spots that build up in small spaces in the cabinet are greatly reduced, which can impact electronical components reliability.